You want to make new animations without using complicated programs? Tamchi has made the perfect tool for this purpose. Not only it’s easy to use, but it's very fun. Here I’ll list the basic steps for combining animations, as far as my knowledge goes. You can use ARZ Explorer and browse to your chosen ARC, then click "Extract" > "All Files". There is a faster way however, using ARC Unpack - go to your Resources folder and right click on the ARC file > Open With... > Tick "Always open with this program" > Browse to ArcUnpack.exe and click on it. From now on all ARC files will unpack automatically when you click on them. Now in a new window go again to Resources folder, where you will find the same 2 directories. Copy all .ANM files from the Resources ANM folders and paste them in the ANM folders in the Database. The purpose of this is the game to load the animations from the Database folder instead those from Resources. Any change you do to them will show immediately ingame. Assuming you've made the steps above, give it a try. Let's say you want to preview the female running animation. In "Database/Creatures/PC/Female/Anm" rename "femalepc_idle.anm" to "femalepc_idle-.anm" (just to preserve it) and rename "femalepc_run.anm" to "femalepc_idle.anm". Launch the game. In the title screen you will see the heroine running instead of standing. Ok, now make another experiment. What if you rename "malepc_run.anm" to "femalepc_idle.anm"? Do it, and see what happens. The girl is running, but her ponytail looks frozen and is pointing inside her back. That's because in "malepc_run.anm" there is no Bone_Pony corresponding for the hair of the girl (bones are responsible for the mesh's movement). This is where Animation Composer comes to help. Everything is almost set for combining. The only thing that needs to be done - under the bones section you can see - 4: "Left Footstep" and 16: "Right Footstep". These are callbacks. They are links to commands for sounds, character rotation and effects that activate when this animation is used. When you combine two animations, all the callbacks from them are recorded in the new one. Callbacks with same names are just multiplied, so if we save now, there will be 2x Left Footstep and 2x Right Footstep. Uncheck one of sets, doesnt matter from male of female. Click on "save animation", browse to the Female/ANM folder and save it as "femalepc_idle.anm" to preview it immediately. Launch the game. The ponytail is no longer hidden in the girl's back. Congratz! You combined your first animation. Next thing you can do with this program is take only chosen bone from one animation and switch it with those from the other. Important thing you need to know is both animations must have the same frame count for this to work properly. You can see the frame count of each animation under the "New Animation" buttons. If the frames are not the same speed, it will freeze the animation of the creature fully or partially. But I'll explain more on this later. 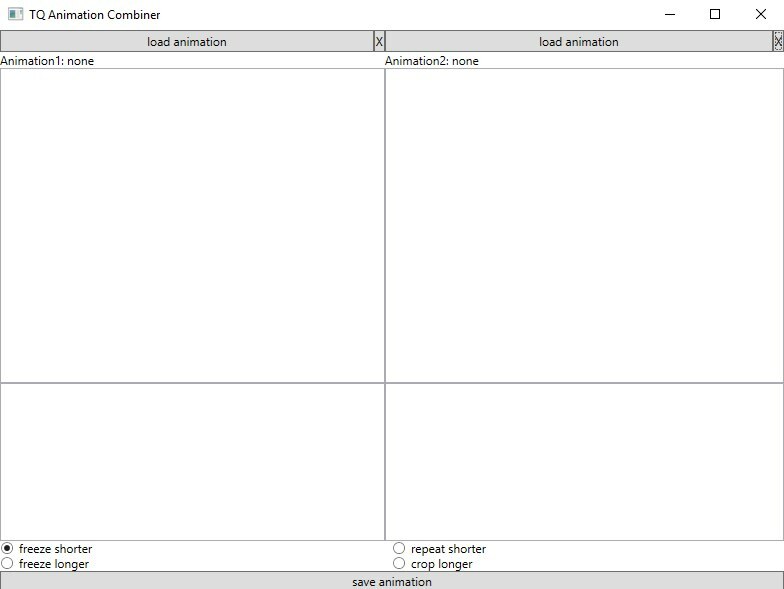 Fo now, find two animations with the same speed and load them. For example, you can try replacing different bones from the two running animations in the previous steps. 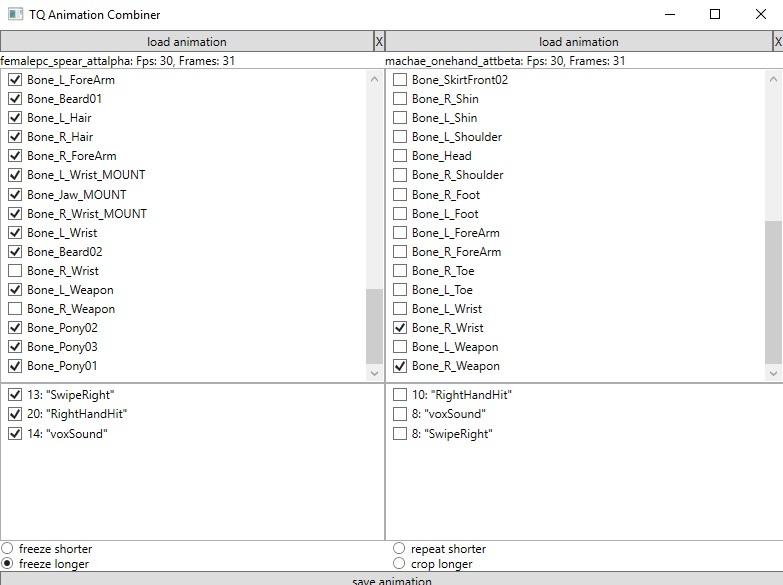 To do it, make sure you uncheck the bones you want to replace and check them on the other animation, which is replacing. Never leave bones checked in both! The possibilities are many, as long as you find the right animations to combine. Make your all extracted Creatures folders easy to browse, because this is a game of many tries. Also be prepared to restart the game many times, to check every little change, untill it works and looks decent. Freeze Shorter/Longer - It sets all AnimationFrames of a bone to first animationFrame of the bone. This applies to all eligible bones based on shorter or longer. 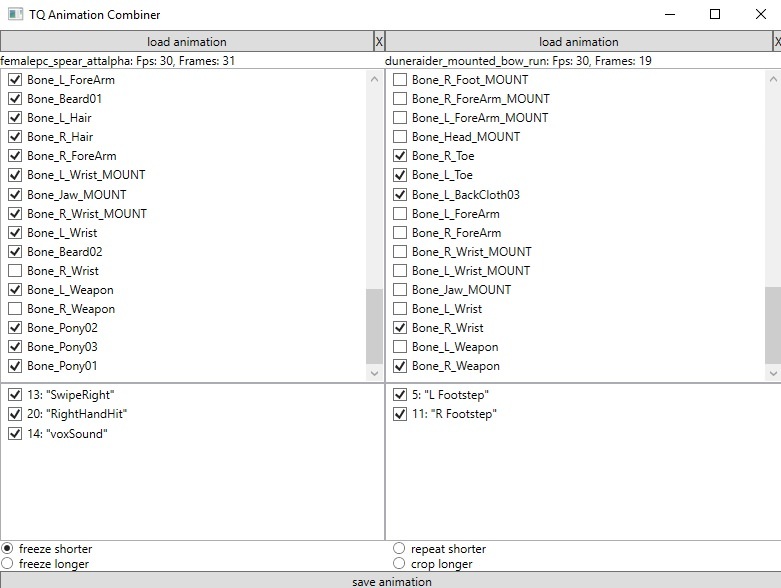 Repeat Shorter - Increases number of AnimationFrames in shorter bones and repeats existing AnimationFrames till new frame count. Crop Longer - Reduces the number of AnimationFrames in a longer bones, hence it crops the animation for those bones. Wow! I'll definitely try this. About the other two - "repeat shorter" and "crop longer", i haven't tried them yet and cant say what they are for. Freeze - It sets all AnimationFrames of a bone to first animationFrame of the bone. This applies to all eligible bones based on shorter or longer. 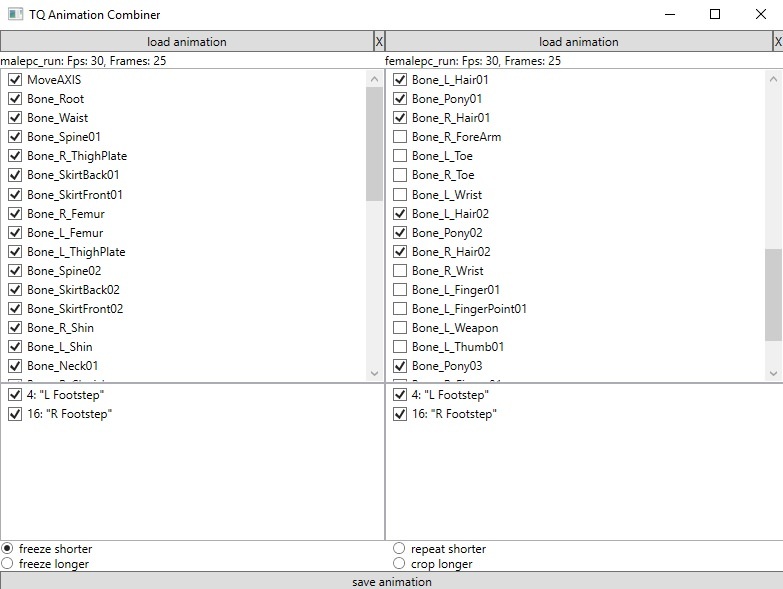 Repeat - Increases number of AnimationFrames in shorter bones and repeats existing AnimationFrames till new frame count. Corp - Reduces the number of AnimationFrames in a longer bones, hence it crops the animation for those bones. Nice finding! I'll test it, may be better than freeze. I'll add it to the OP. You can use Viewer to fast preview any msh & anm asset as long as you have the game directory path (or similarly the path of a built mod directory with custom assets) set in "Additional browse directories" field in AM, Tools/Options. That includes archived assets too, except for the contents of XPack2 folder which's path still isn't recognized since Ragnarok release. Ok, I'll try that, thanks. If it display attachments (e.g. the mount) it will be perfect. Found this old text file where I've added descriptions for combat animations. Some of them are unused, might come handy to someone. femalepc_dw_skill_crossblades – dual wield inward cross slash vs 1 target. femalepc_dw_skill_doublex - 2 targets dw anim. femalepc_dw_skill_jumpslash - power dw attack 1 target. femalepc_dw_skill_wardance* – 360 attack + backflip. Looks good and agile, not bad with spear also. femalepc_onehand_shieldcombo - shield bash + weapon slash or dual holding 1 hand weapon. femalepc_onehand_skill_aoe360 – same as dwaoe360. femalepc_onehand_skill_chop* - one hand power att. Melee, no spear. femalepc_onehand_skill_doubleslash* - diagonal + horizontal slash. 2 targets. Sword, Axe. femalepc_onehand_skill_hew - jump + power att. Melee, no spear. femalepc_onehand_skill_phantasmstrike* – look to the sky + power att. Melee, no spear. Probably hammer. femalepc_onehand_skill_sheildbash - shield hit, outwards. femalepc_onehand_skill_shieldcharge - shield hit, forward. femalepc_onehand_skill_shouldercharge - power shield hit, forward. femalepc_onehand_skill_thrust* - piercing attack, forward. Sword. femalepc_pickup_kneel* - slower than default. femalepc_spear_skill_brace* - hoplite stance, probably good for some spear buff. femalepc_spear_skill_dualslash - fast, dual hit. Right now used for default attack. femalepc_spear_skill_tempest* – whirlwind + thrust + step back. Looks cool. femalepc_spear_skill_triplehit* - Nice one. 3 targets. femalepc_staff_skill_spellfury* - good for staff, dual ranged or fist weapon. femalepc_taunt* - good for battle cry. Sure. 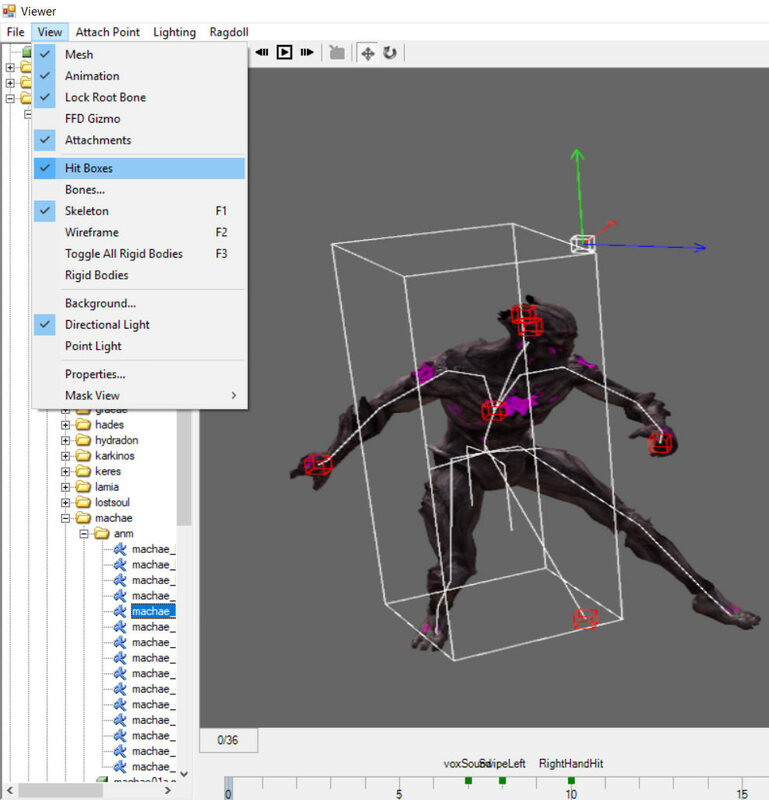 You can view attach points, hitboxes, bones & skeleton of a mesh and callbacks for an animation. Furthermore it allows you to create new .mif & .aif for meshes and animations respectively, so you can place attach points and edit physics data where you actually see it, in contrary to something like MeshView.